I came across the word in a reflection I was reading as part of my daily devotion. It was used in reference to the manger scenes that become prevalent around this time of the year as we prepare for Christmas. I had never thought of the manger scene in this term. I have always used the word sanitize, which in some way is much stronger; but prettify gives it a certain charm that, as the definition states, makes it superficial. We tend to become superficial people around this time of the year, showing kindness in an insincere sort of way. We put our best face forward, reach out to people we would otherwise have never given a second glance, and give generously to causes that on other occasions occupy not even the deepest recesses of our minds. 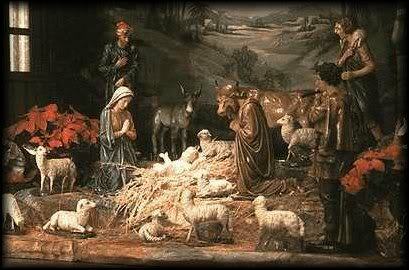 It all stems from that beautiful manger scene that we glorify as Christmas fast approaches. We see it everywhere: on church lawns, on ads and commercials, on Christmas cards. It is a pretty scene, and gazing at it intensifies our desire to prettify our image and ourselves in such a way as to make us worthy of a place alongside Jesus, Mary, Joseph and the shepherds in the stable. But have you ever considered the fact that no one ever sweats on those images? Have you considered the fact that no one, not even the shepherds, smell on those images? Have you ever considered the fact that not one article of clothing shows a wrinkle, or a hair is out of place, or that anyone looks sad? No. They’re all…prettified. And yet, the reality is that nothing could have been further from the truth. This was a stable, and truth be told, it was more of a hole, a cave dug out of the side of a hill. Mary had just given birth and, I don’t know about you but, most mothers of newborns that I’ve seen don’t wear makeup and aren’t their most attractive even the day after their child is born. We haven’t even mentioned the animals. Sheep, cows, donkeys, they all live either outdoors or in barns. Not with humans! That manger – the real one – is a metaphor for the mess that is our lives, with its sweat, its smell, with its wrinkles. And it is into this mess that Jesus chose to be born. He came to clean up the mess. To prettify us. Not in a superficial or insubstantial way, but in a meaningful way. It is because of Jesus that we are assured we will not have to wallow in that mess forever, but we will be prettified. Your development of this concept in your sermon today helped me to truly appreciate the meaning of this glorious day. Indeed, the “prettification” of the manger is perhaps just a deviation of the commercialization of Christmas. Yet, as humans, bound as we are to sinful ways, I believe God forgives our ‘prettification’, indeed….even “sanitatization” of the manger as an understandable desire to separate our shortcomings from the purity of his essence. That we still endeavor to acknowledge the common humbleness of a manger as the birthplace of the King of Kings, as opposed to the splendor of a palace, hopefully can be acknowledged by Him as, at least, a “baby step” in the direction to the full acknowledgement of his Grace. After all, in the grand scope of the prospect of eternal life in his Kingdom, we ALL of us, regardless of age, are but babes.